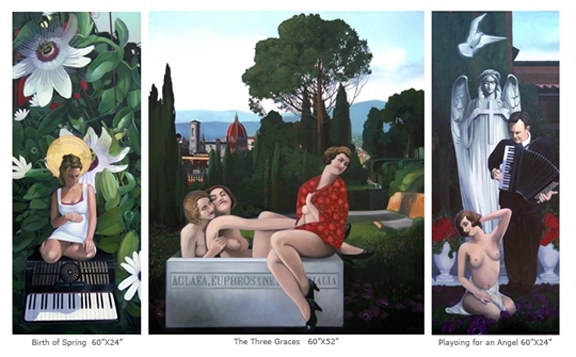 The Transit of Love is a Triptych created for the 2009 Florence Biennale. Panel one depicts the Immaculate Conception. Pregnant among passion flowers and seated on and accordion, the music of life begins. The center painting shows the Three Graces in a more sexual situation than historically depicted with Florence as their backdrop. The third panel confronts death and remorse and the afterlife.